Ah, the new year. A time for contemplation, setting of targets, new goals to aspire to. A time too for review and change. As you’ll have noticed every time you desperately clicked “refresh” seconds after you turned on your computer each morning, it’s been a little while since my last post. A few weeks off over Christmas led inexorably to introspection and then – dare I say it – apathy. Dear reader, I couldn’t quite pull my finger out and summon up the energy to tap out a few words about the vegetables that happened to be on my mind at the time. I’m ashamed to say that I found the idea a bit of a drag. It seems that after just a year of trotting out self-important waffle about my allotment I have lost my mojo. I can’t think of anything interesting to say about fruit and veg. As my fingers dance across the keyboard the words that appear on the screen in front of me just aren’t worth reading. What has happened? Where have the achingly funny posts gone? The hilariously witty comments on modern allotment life? Nope, there’s nothing left. I am an empty husk. This is not a good state of affairs. Something must be done. The last thing the digital world needs is another tedious halfwit churning out lists of the vegetables they planted and how tall their seedlings are this week. A blog should be better than that. So I’ve decided to call it a day. A greater blogger than I might rage against the lying of the light, might see this as a challenge to raise their game and reach ever higher standards. But friends, I am no such being. I haven’t even removed the dead tomato plants from the greenhouse: really, what are the chances of me making that kind of effort? No, it’s curtains for Drooling. It’s been fun while it lasted, and I shall miss you, my virtual friends, but you deserve better. Be free! Find new blogs! See what you’ve been missing while ploughing through this self-indulgent drivel! (You could do worse than look at the blogs mentioned on the right hand side, by the way). On the ipod while gently dabbing the eyes. (must have some grit in them or something). The Strokes / Is that it? It’s bloody freezing outside. The snow melted and froze into ice, and then it snowed on top of the ice, which melted a bit, and now it’s freezing outside. Not good. Time then, for a little ray of sunshine. But before that, some outstanding business to wrap up. Last week saw the inaugural Drooling Vegetable competition, and my underlings are still picking through the postbag. Some heroic suggestions, along with some truly awful gags from Mal, and a discovery that in the States the swede is known as Rutabaga. The winner, though, is Amy, for her identification of a whole page of swede recipes, and in particular the Indian Spiced Swede Cakes. Hurrah! Anyway, back to the sunshine. Back at the beginning of October I had a day off and took myself off to Chelsea Physic Garden. I’d read about it for ages but never quite managed to visit. 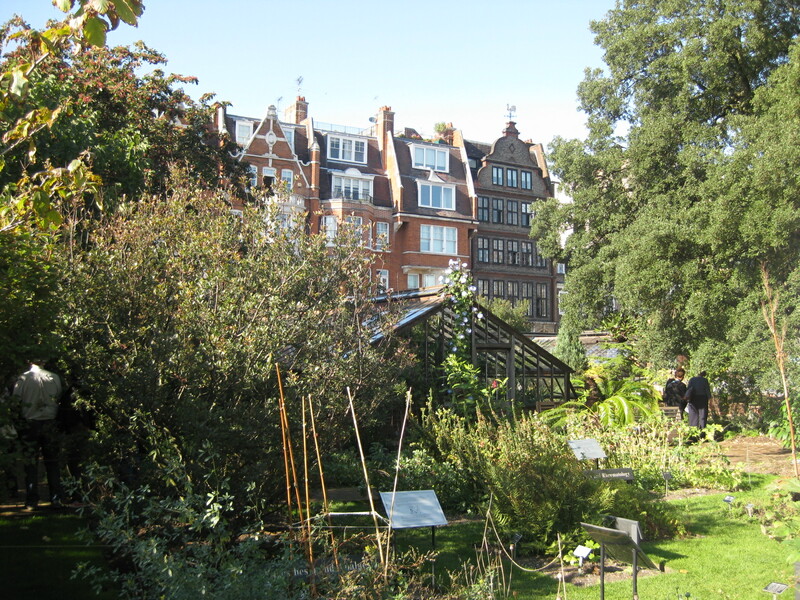 It’s a little garden square just over the road from the Thames, founded in 1673, and dedicated to growing medicinal herbs and plants. It’s also only open four days a week, nowhere near a tube station and ringed by traffic wardens. Unsurprisingly, when you finally get there you’ll find it’s quite quiet. It’s £8 to get in, which when you cost it up as a price per square metre of garden probably makes it the most expensive garden in Britain. It’s also full of posh old people. I know! Posh people in Chelsea! I was gobsmacked! You do get a handset with your admission, which has a commentary narrated by John Snow, but most importantly, it has a very nice café, staffed by some more posh people, and selling a range of very tasty cakes. Now you may have noticed that this is a gardening blog, and we’ve got this far into a post about a garden, and there’s nothing mentioned about the…um…actual garden. Well, truth be told I didn’t find it that inspiring. Yes, the setting was beautiful, the beds were packed full of plants and the labels suggested they were all hugely important or extremely rare, but as a visual spectacle (shallow, shallow me) it didn’t really do it for me. Still, nice cakes. And full of posh people. After almost ten months of blogging I feel I need to do something new, something different to keep you, my adorable public, happy and interested. I fear that weekly ramblings about vegetables are just not enough to keep you demanding blogophiles still clicking. So here it it, the inaugural Drooling Vegetable Competition! I am sneakily attempting to combine this with this week’s gardening dilemma. Well, I say this week, but in truth it’s a poser that I’ve faced for longer than I care to remember: how do you make a Swede interesting? I’m sure that on far more stimulating blogs than mine, that question should be the first half of a very dirty joke involving Scandinavians, but I’m afraid you, dear reader, will have to take it at face value. You see, each year I plant the seeds, grow the veg and then, about this time of year when there’s bugger all else growing in the garden, I start to get really, really, REALLY bored of mashed swede. Yes, the butter livens it up, I agree, a heavy hand with the pepper can add a bit of zip, but really, there must be more to the vegetable than a saucepan of hot water and a nob of butter. Buggered if I know what, though. Try as I might I can’t find anything more inspirational to do with the things. So, this year’s competition: send in your swede recipes and prove that the vegetable is worth it’s place in the kitchen. It’s got to be more creative than lobbing it in a stew with whatever else is still standing on the allotment or mashing it and dumping it next to the proper stuff on your plate. Put your creativity to the test! Humble me with your dazzling culinary genius! Make me eat my swede-bashing words! Answers underneath this post please, and the winner will receive a wonderful mystery prize, delivered just in time for Christmas…. On the ipod while awaiting a tidal wave of Swede-ish recipes: Abba / Winner takes it all. Abba? Swede? Geddit?!?!?!? It’s grim out there. A rainy, windswept tundra. There’s not a lot growing on the allotment at the moment, and what’s more it’s months before I even get to plant most of my next crops, let alone eat them. Dare I say it, I’m even starting to get a little bored of parsnips for tea. Luckily all is not lost, for in the corner of the plot, standing tall, is a plucky little survivor. Feast your eyes on my Cavolo Nero, a tough and perky Italian cabbage. 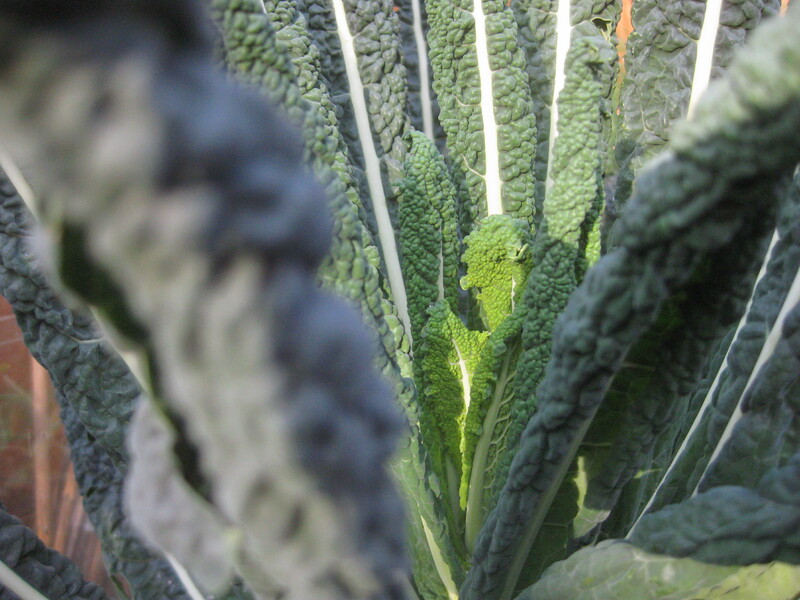 It’s related to good old British curly kale but it’s somehow showier, a bit flash. A touch more extrovert. Whereas the humble British cabbage gets on with growing in a sensible, modest and compact ball of leaves, this gaudy braggard puffs out its leaves in a boastful show of frippery and egotism. Still, it tastes delicious. Before I give you the recipe below, modesty compels me to add a little caveat. The pasta sauce is undeniably mouth-watering, but it is essentially a base of garlic, cream and parmesan with some cabbage added. Quite frankly you could add my youngest son’s underpants to a base of garlic, cream and parmesan and I’d still eat it. And one last thing: make sure you check carefully inside those adorably frilly leaves. I make this pasta dish for one ever since Mrs Drooling found a cutsey little caterpillar curled up inside a mouthful of her serving last year. Cook your pasta. While it is cooking fry the chopped garlic in a little olive oil. After a couple of minutes add the chopped cavolo nero. It will wilt in a few minutes. Add the cream and let it bubble gently until the pasta is ready. Drain the pasta, saving a couple of tablespoons of water, and mix the pasta, sauce, cheese together. It can get a bit claggy, so use the cooking water from the pasta to loosen it until you get just the right consistency for your tastebuds. On the ipod while cooking: Verdi / La donna e mobile. Flighty? Don’t get me started: she wouldn’t even eat a caterpillar! Free! Just send a stamped addressed envelope! Blimey! I mean, what the ?*@$! Who’d have thought it? Countless blogs on such controversial topics as the planting in the long border at Great Dixter, or the right way to make aubergine dip, and barely a murmur of disagreement from the millions of regular correspondents. But a few simple observations on compost and…..wow! I stuck my metaphorical fork in the a big steaming pile of verbal compost, turned it over and struck, well, if not black gold, then certainly a rich seam of contention. As Mal sensibly pointed out, my estimate of 17 years to make compost was a little on the long side. I stand corrected. Hyperbole has no place in the blogosphere. Other correspondents, more committed and conscientious – dammit I’m man enough to say it – just better gardeners than me expressed disappointment at my stance. A gentle, almost parental disappointment, but still enough to make me feel as dirty as the compost I so frivolously buy instead of make. But not Louise! The sole kindred spirit out there who owned up to having a spot of bother with the mysterious alchemy herself! I hear you, sister! And despite all of the suggestions as to how I could improve the process, I’m still not sure how to solve the problem of volume: since last week’s post I have managed to conjure up another 2 bags of garden rubbish. That makes around 30 bags a year. 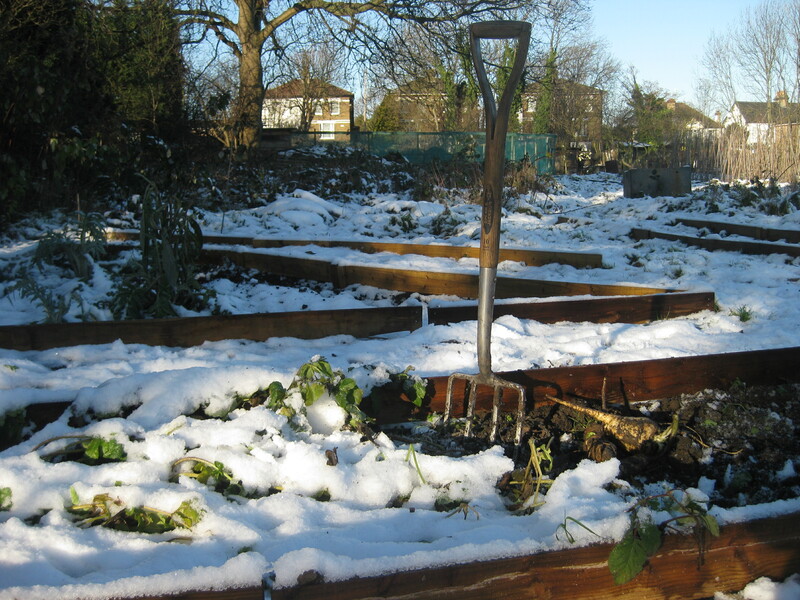 Even if that turns into compost in under a year that’s still a compost heap roughly the size of….my allotment. Hmmm. But never fear! I have come up with a fiendishly clever plan that keeps everyone happy! …this week’s Special Offer! Just send in one stamped addressed envelope and I promise I will fill it up with lovely compost-able material and send it back. Before you know it – hey, probably before the letter even falls through your letterbox – you’ll have your very own pot full of Drooling-brand compost! On the ipod while feeling festive: Hot Chocolate / Everyone’s a winner. Yes, you too! Don’t delay! Send in today! This is not a controversial blog. If you come here looking for divisive views or contentious polemic then you will, by and large, be disappointed. I’m a simple man and my only aim is to bore you with harmless tales of my vegetable growing exploits. This week, however, I tread on slightly crumblier soil. There may even be some offence caused. But first some scene setting. I spent this afternoon tidying up in the garden. The Magnolia in the middle of the lawn has been dropping leaves for weeks and the borders are full of things that have been slowly dying for some time. 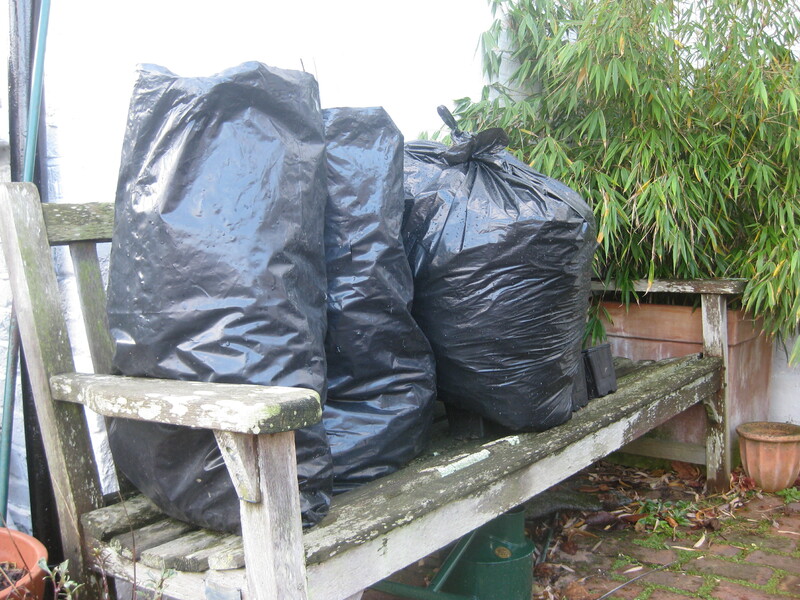 After only an hour I had 5 bin liners full of green waste sitting on the patio. Now what do to with them? And this is where I part company with some proper gardeners. I took them to the tip. That’s right: I threw them away! I didn’t take them to the bottom of the garden, I didn’t put all that lovely organic matter, wet leaves, stalks, plants, on to my compost heap to continue the cycle of veggie life by making my own compost. I don’t even have a compost heap! I have come to the conclusion that making compost is a green sham. In my own experience – unscientific, I grant you – it takes approximately 17 years for garden waste to rot down into something that is remotely usable in the garden. During which time you will generate a further 1,347 bags of garden waste. This would require a compost heap roughly the size of Belgium, along with several labourers to turn and dig over the compost to “speed” the transformation into compost. Or you can take it to the tip, where it gets taken to a local farm and turned into compost which is them resold (I checked!) and buy some organic compost from the garden centre to use in the meantime. And that Belgium-sized corner of your garden that is now freed up can be used to grown some more vegetables! On the ipod while…um…looking after the environment: Johnny Cash / Forty shades of green. And all of them in a bin liner in the boot of the car. It’s the question on everyone’s lips. I’ve been deluged with comments on the blog demanding an update. Audience members on Gardeners’ Question Time have been pestering the panel for months. I believe Toby Buckland even mentioned it on Gardener’s World just before he started clearing his desk. Just what has been happening to the horseradish planted on The Drooling Vegetable’s plot back in April? Well folks, you’ll be delighted to know that the wait is over. 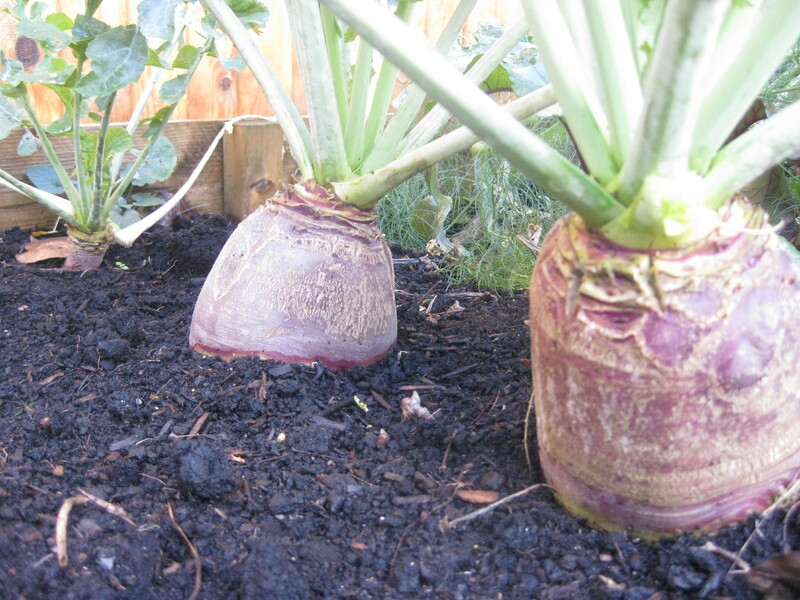 This week we have news of the great root, along with a mouth (and eye-) watering recipe. But first, in a pathetic attempt to garner some gratuitous hits on the site courtesy of dim-witted search engines looking for keywords, let me just repeat some relevant phrases: Eye-wateringly enormous root. Spicy! Hot! And now let me apologise to anyone who has stumbled across this blog looking for something rather different. Blame your search engine. But I digress. So, after planting the fairly pathetic plants back in the Spring I politely ignored them throughout the summer as they went about their unremarkable business on the plot. No flowers, not particularly pretty foliage, all in all a deeply functional plant. Last week, with Roast Beef on the menu, it was time to dig up a plant and see what was going on. And there they were: some tasty-looking roots! Not much thicker than a pencil, they looked a little parsnip-like, but with a reassuring, if faint, whiff of, well, horseradish. Grate your horseradish and stir it into the crème fraiche. About 3-4 tablespoons of root and about 100g of crème fraiche. Add 2 tbsp lemon juice and 1 tbsp vinegar. Add a bit of sugar and salt. Adjust all of the above quantities depending on your taste. Serve alongside rare roast beef with Yorkshire pudding and a nice glass of Claret. Feel ineffably proud to be British / deeply envious that you are not British and cannot therefore experience such emotions. On the ipod while eating: Dryyour eyes / The Streets. Told you it was spciy. Allotment 2 Kitchen Vegetables! Recipes! What’s not to like? Garden Organic More seeds. These ones are organic (mostly). Seeds of Italy Lots of seeds. With Italian names.